This dense, thin, fruit-filled cake showcases luscious end-of-summer fruits: raspberries, blueberries, Italian prune plums, blackberries... Take your pick, or mix and match. And, when summer fades into fall, and it's time to think about Thanksgiving desserts, this recipe can be turned into a luscious cranberry cake — see the tip below for directions. 43 mins. to 51 mins. Preheat the oven to 350°F. Lightly grease an 8" or 9" square pan, or 9" or 10" round pan. Beat together the butter, sugar, baking powder, and salt until smooth. Add the eggs, beating until thoroughly combined. The mixture may look somewhat coagulated; that's OK. Stir in the vanilla and optional flavor. Add the flour, mixing to make a smooth, stiff batter. Spread the batter in the pan. In the larger-sized pans, the batter will be spread fairly thin; that's OK. Spread the berries or plums on top. If you use plums, place them with their skins up. Sprinkle with the cinnamon-sugar. Bake the cake for about 35 to 40 minutes, until a cake tester inserted into the center comes out clean, and the cake showing around the berries is a light golden brown. Remove it from the oven, and serve warm, or at room temperature. 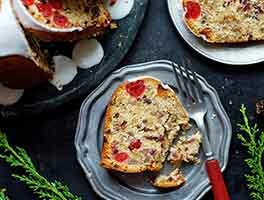 Here's a tasty variation for Thanksgiving: Cranberry Cake. Line a lightly greased 8" round cake pan with parchment or waxed paper; grease the paper. Make the cake batter, and spread it in the pan. 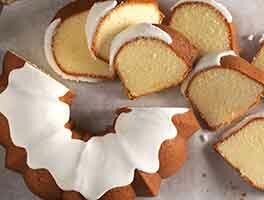 Bake the cake in a preheated 350°F oven for 10 minutes. Remove it from the oven, and quickly and carefully top with 2 cups (8 ounces) fresh cranberries. Sprinkle the cranberries with 1/3 cup granulated sugar + 2 tablespoons coarse sparkling sugar; or with 1/2 cup granulated sugar. 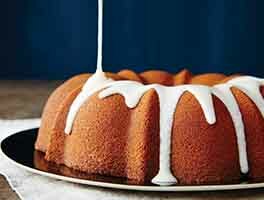 Bake the cake for an additional 45 minutes, until a cake tester or toothpick inserted into the center of the cake comes out clean. Remove from the oven, and serve warm — as is, or topped with ice cream or whipped cream. Wonderful! I think this would be yummy with peaches and raspberries! 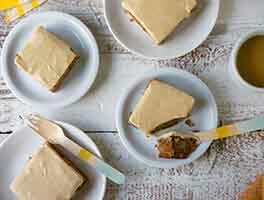 Just the kind of simple cake I like to eat! I topped it with the little odds and ends of fruit I had: strawberry, blackberry & peach. I am excited to try it with cranberries! I made this on Saturday and it was wonderful, I added lemon zest to the cake batter. I used chopped strawberries, blueberries, raspberries, and some cut up blackberries (they were huge). The only thing I would do next time is cut back on the sugar, it was pretty sweet. It baked a lot longer than instructed, the middle just wasn't cooking, and my fruit was pretty wet. I really love the crust it had, I baked it in a stoneware round baker. I made this with two baskets of blackberries and one of raspberries (minus a few that I had to "taste" to check for sweetness.) I used a 8 1/2 by 12 oval crockery casserole. It took about 55 minutes to bake. It is a wonderful recipe. I especially liked the fluffy, light cake. I have added the cranberry version to my cookbook program. It will make a nice addition to our favorite Nantucket Cranberry Cake during the holiday season. By the way, the three baskets of berries were about 18 ounces (minus less than an ounce for tasting.) It was fine, not too loose or jammy. I made this for my husband's walking buddies at the mall. They meet @ 7am. 5 days a week to walk the mall for exercise. They loved this coffee cake, they told me it was the best one yet. Thanks for the recipe. This was a big hit at work today, with requests to bake the cranberry variation for Thanksgiving! I am not an experienced baker, and also have to work with a temperamental oven that was installed in 1984 and requires some significant patience! But this recipe is really great - very simple, and clearly forgiving of sudden shifts in baking temperature! But the thing I really loved about the recipe was the addition of helpful hints like "the batter will be spread fairly thin; that's OK" - great for bakers like me who are often standing looking in the mixing bowl and thinking 'well, that can't be right'! :) Thanks! Will definitely be baking this again, and looking for more to try. Fabulous! 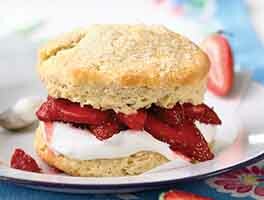 This recipe is easy to make, looks pretty, and tastes divine! I made it with a combination of blueberries and raspberries. I made it both in an 8" square pan and 8" round pan. The 8' round pan makes it look a bit fancier. I look forward to making this with Italian Plums. This is a keeper and I will try it year round with different fruits. I just love this recipe, anytime when there's extra fruits, I bake this torte. Any fruit or berry works, and any combination as well. Thank you KAF. Where has this been all my life? We have a bumper crop of blueberries in our back yard this year and I have made this at least 3 time in a two week period. Everyone loves it.... its easy and quick. Making it again today for book club. My swedish heritage thought cardamom would be a nice replacement for cinnamon and it was delicious. A keeper for sure!